St. Louis’ Liederkranz, a German singing society, is considered to be the oldest of its kind, west of the Mississippi River. Founded in November of 1870, it was considered one of the most exclusive venues among German-Americans in St. Louis. During the social season the club sponsored a semimonthly ball. The German press printed glowing reports of these events complete with the names of the most socially prominent in attendance and descriptions of the women’s beautiful gowns. The Liederkranz was one of the most socially acceptable clubs for the more affluent St. Louis German-Americans who wished to retain ties with the homeland. Traditions that were broken and lost due to World War I and World War II. 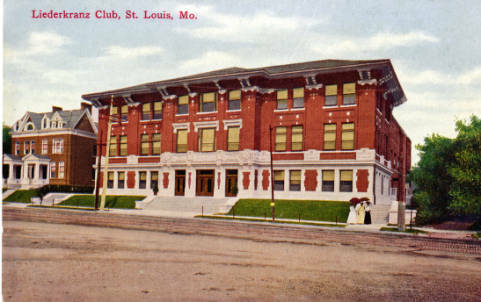 The group used a hall downtown at 13th and Chouteau, until 1907 when it built its’ first building on South Grand Avenue. According to its members, this new building housed game rooms, private and public meeting rooms, a Rathskeller, several dining halls, (and kitchens) bowling alleys, concert and dancing halls. It also included a rehearsal hall, musical library, and director’s room. The building was the work of William Albert Hirsch, a partner with the architectural firm Helfensteller, Hirsch & Watson, which had also been founded that year. The same firm also designed St. Louis’ Moolah Temple. Today the club is a choral performance group that seeks to preserve the rich tradition of German music in the St. Louis area. Rehearsals are held each Tuesday at 7:30 pm at the German Cultural Society at 3652 South Jefferson Ave in St. Louis. The group performs at various venues in the area and has a concert and dinner each year. For more information contact Norm Cleeland at 636.225.7332. The group will be performing at 2pm for Missouri History Museum’s German Heritage Cultural Fest on Sunday, January 25, 2015.